Stephanie Eagleberger, Laura Wipf, Jake Dahl, and Katie Dickens with high-seller Slighty Icy at the Heritage Place Winter Mixed Sale. OKLAHOMA CITY, OK�JANUARY 26, 2012�Royal Vista Ranches, LLC, Agent, led all consignors at the recently completed Heritage Place Winter Mixed Sale with 80 head selling for $1,552,050, an average of $19,400. 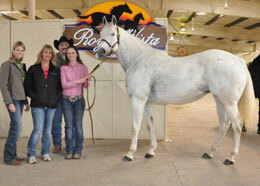 Heading the Royal Vista group was the Lucas Racing Dispersal that saw 30 head bring $559,950. "We would like to thank all of our consignors and buyers who purchased these fine horses at the Winter Mixed Sale," Laura Wipf, co-owner of Royal Vista Ranches, LLC said last week. Five of the winter mixed sale's top 10 sellers were handled by Royal Vista including the highest selling broodmare, Slightly Icy, and the second highest selling broodmare, Last Shall Be First. A Grade 1 producing daughter of Chicks Beduino, Slightly Icy was consigned by Deverne Weston and purchased by Mar Jahnel's MJ Ranch. Slighty Icy was bred to all-time leading sire First Down Dash for a full-sibling to Rainbow Futurity(G1) winner Hes Too Icy For Me ($355,127) and stakes-placed Mighty Icy ($20,562). Guy Peixoto, Petrus Peixoto, Luis Alvarez and Laura Wipf with second high-seller Last Shall Be First. Luis Alvarez paid $225,000 for Last Shall Be First, a daughter of Strawfly Special in the final session. Consigned by Royal Vista Ranches, LLC, Agent For Childers Ranch, LLC, the 14 year-old mare is the dam of four stakes horses including Last To Fire ($550,478), Last To Check Him ($283,689), Jazz Be First ($165,139) and Better Check Me Out ($12,830). Grant Farms, LLC purchased the winter sale's fifth and sixth high sellers, Seaside and Corona Deluxe, from the Lucas Racing Dispersal. Seaside, a stakes-placed full sister to world champion WAVE CARVER and championOcean Runaway brought a final bid of $86,000. She sold open. Grade 1 placed Corona Deluxe sold for $82,000. 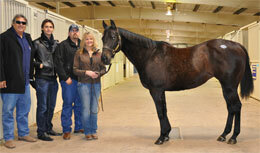 The open daughter of Corona Cartel earned more than $168,000 and is the dam of stakes winner Country Boy Deluxe. Both mares had 2013 embryos that sold separately. The Ocean King, a Corona Cartel half-brother to WAVE CARVER and Ocean Runaway was the high-selling two-year-old at $67,000. He was purchased by Ocean King Partnership from Royal Vista Ranches, LLC Agent for Lucas Racing, Inc.
Special Ela, a stakes winning Special Leader mare was purchased for $60,000 by EG High Desert Farm, from the Lucas Racing dispersal consignment. She was in foal to world champion sire Stoli.